Spasm of accommodation is characterized by intermittent and usually painful convergence, accommodation, and miosis in varying combinations with variable amount of time. Various etiologies have been implicated, including functional spasm of oculo-motor muscle, hysterical convergence spasm and emotional distress. The excessive accommodative tone usually causes pseudomyopia. We herein report scheimpflug imaging in a patient with spasm of accommodation. A 17-year-old girl complained of sudden onset blurring of vision in both eyes following prolonged reading under a dim light. It was associated with mild headache and eye strain. She was a known case of myopia. Her refractive error was -2 diopters in both eyes. Her records showed that her refractive error increased to -4 dioptre sphere on the day of her complaint and she was prescribed spectacles on the same day. She was on salbutamol inhaler for bronchial asthma. At presentation to us on the third day of her symptoms, visual acuity was 6/36 and 6/24 in the right and the left eye with -4 dioptre spherical correction which she was wearing in both eyes. BCVA (Best corrected visual acuity) was 6/6 with manifest refraction of -7 diopter sphere OD and - 7.5/-0.5 × 70 OS. Anterior segment examination revealed miosis, shallow anterior chamber in both eyes. Intra-ocular pressure on applanation tonometry was 14 and 16 mmHg in right and left eye, respectively. 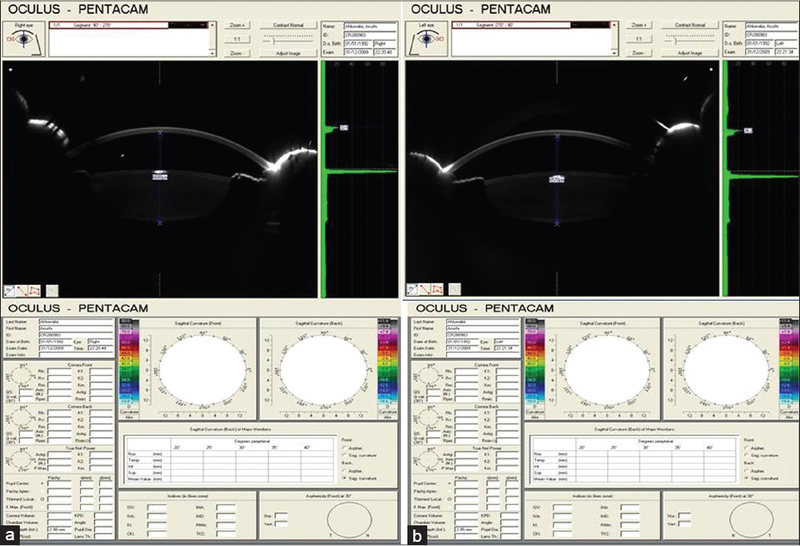 On Pentacam examination after dilatation with phenylepherine 5% drops, the anterior chamber depth was 1.64 mm OD and 1.57 mm OS. 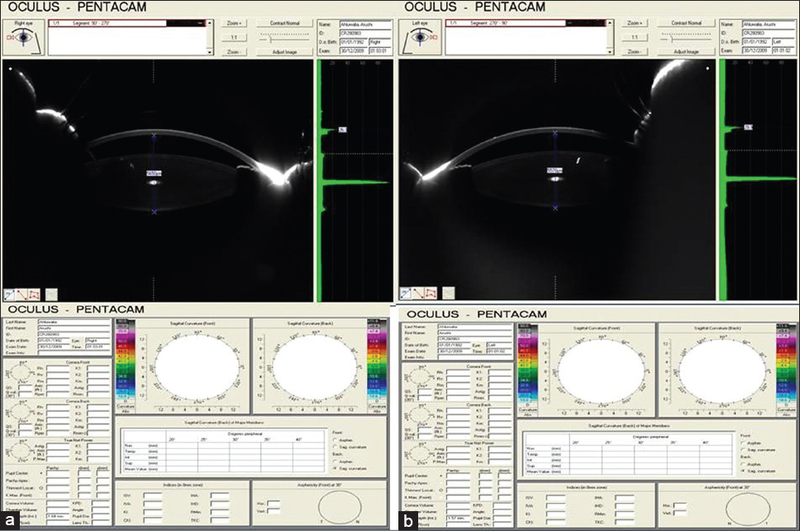 The crystalline lens thickness was 4.01 mm in the right eye and 4 mm in the left eye and the distance between the cornea and posterior pole of the lens was 5.65 mm OD and 5.57 mm OS [Figure 1]a and [Figure 1]b. Cycloplegic refraction under cyclopentolate 1% done 1 day later showed -1.5 dioptre sphere in the right and -1.75 dioptre sphere in the left eye and visual acuity of 6/6 OU. At this time scheimpflug imaging showed an anterior chamber depth of 2.98 mm OD and 2.95 mm OS with a lens thickness of 3.7 mm in the right eye and 3.62 mm in the left eye and the distance between the cornea and posterior pole of the lens was 6.68 mm OD and 6.57 mm OS [Figure 2]a and [Figure 2]b. No supraciliary effusion could be documented on ultrasound biomicroscope. A diagnosis of accommodative spasm was thus made clinically and morphological changes were documented by pentacam. The patient was put on cyclopentolate 1% drops once a day. Accommodative spasm is a condition where there is an involuntary, sustained accommodation in the absence of an accommodative stimulus. The anterior lens becomes more sharply curved, moving closer to the cornea. Baikoff et al. analyzed the anterior segment changes during accommodation using optical coherence tomography (OCT). They found that the anterior pole of crystalline lens moves forward during accommodation and there is a linear relationship between this movement and anterior radius of curvature. Accordingly the posterior curvature decreased proportionally. Controversy still exists as to the movement of the posterior lenticular surface during accommodation. Recent study by Strenk et al. reported no movement of the posterior lenticular surface during accommodation whereas Bolz et al. have showed posterior movement. , Koretz et al. showed that in young adults the posterior lens surface may tend to move posteriorly a short distance as well, so that total anterior segment length may increase slightly whereas in adults this surface moves forward adding to the decrease in anterior chamber depth. Tsorbatzoglou et al. found by partial coherence interferomtery that the decrease in ACD was greater than the increase in anterior segment length (ASL) and thus hypothesized that the crystalline lens move forward simultaneously during accommodation. Dubbelman et al. found significant anterior movement of the human lens during accommodation. In our young patient we observed forward movement of the posterior lenticular surface as well. It may be hypothesized that this anterior movement of the posterior surface of the crystalline lens occurs in accommodative spasm which contributes to the increase in accommodative amplitude. A myopic patient will appear to be more myopic, a hyperopic patient will appear to be less hyperopic and an emmetropic patient will appear to be a myopic. Scheimpflug imaging is an important tool in objectively quantifying the changes in accommodative spasm. Cogan DG, Freese CG. Spasm of the Near Reflex. Arch Ophthalmol 1955;54:752-9. Goldstein JH. Spasm of the Near Reflex: A Spectrum of Anomalies. Survey Ophthalmol 1996;40:269-78. Smith JL. Accommodative spasm versus spasms of the near reflex. J Clin Neuro-Ophthalmol 1987;7:132-4. Koretz JF, Cook CA, Kaufman PF. Accomodation and presbyopia in the human eye. Invest Ophthalmol Vis Sci 1997;38:569-78. Baikoff G, Lutun E, Ferraz C, Wei J. Static and dynamic analysis of the anterior segment with optical coherence tomography. J Cataract Refract Surg 2004;30:1843-50. Bolz M, Prince A, Drexler W, Findl O. Linear relationship of refractive and biometric lenticular changes during accommodation in emmetropic and myopic eyes. Br J Ophthalmol 2007;91:360-5. Tsorbatzoglou A, Nemeth G, Szell N, Biro Z, Berta A. Anterior segment changes with age and during accommodation measured with partial coherence interferomtery. J Cataract Refract Surg 2007;33:1597-601. Dubbleman M, Van Der Heijde GL, Weeber HA, Vrensen GF. Changes in the internal structure of the human crystalline lens with age and accommodation. Vision Res 2003;43:2363-75.